So a while back we talked about Multitracks. Lots of people are using these pre-recorded loops to help enhance their services. We gave some great resources to purchase these types of loops in This Blog. What we didn’t discuss was how to use them. Even that question has multiple facets to it. Both the technology needed to use them well and how they fit in your set so they are an add and not a distraction. We will discuss that now and for fun, we’ll throw in some of the pitfalls of these tracks as well. First let’s talk about the technology. There are several ways that these tracks can be run and multiple locations they can be run from. Option 1 is from your Audio Front of House location. Your sound engineer is then in control of running these tracks. They might play them out of software like Digital Performer or some other source. The nice thing about Digital Performer or another DAW is the option to output separate channels. For instance, the drum loop can go to one channel on your console, while the guitars are on another and keys are on yet another. This gives great controllability and flexibility of these tracks. The downside of running from FOH is that your sound engineer or producer are in complete control. If you are the worship leader on stage, you are now at the whim or plan of whoever is running those tracks. That can be difficult or confining. A second option is from your Computer Graphics location. This would put your tracks in the hands of your video team if you have one. This option most likely loses the availability to separate the parts onto separate channel strips as this would fire out of something like ProPresenter. The positive here is the ability to sync with a video. If you have a special lyric video or something similar, this makes those matching up work better. Digital Performer does have an option to have a movie in that system, but there can be a sync issue as it sends to your screens. This also has the downside of being at the mercy of the video booth and producers. A last option is to fire your tracks from a stage location. This is generally something that can be set up next to a drummer. 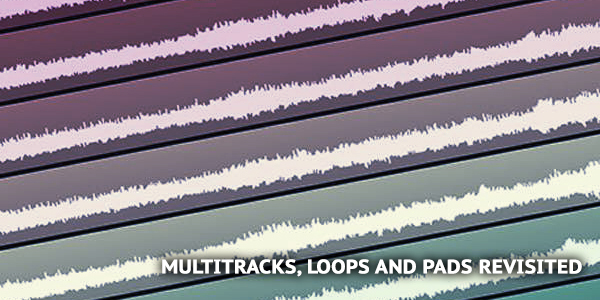 Since these multitracks are built with click tracks, it makes sense for the drummer to do it. Purchasing a unit like the Roland SPD can really be helpful. This unit connects through USB so you can load the tracks onto the SPD and program which pad you hit to start and stop the track. Like the CG option, this now limits you to LEFT and RIGHT outputs and not the flexibility of individual instrument control. The biggest advantage to using this option is it gives the worship band control. This sounds petty, but can be a big deal. It is much easier for a worship leader to signal a drummer or other band member than it is to signal a booth somewhere. So if the leader is feeling led by the Holy Spirit to pause for a moment between songs that wasn’t planned, he can more easily have his drummer not play the next song until they are ready to go. All three uses are valid and work great. And all 3 could be used within the same service, depending on the application. Picking which is right for you and your team is a discussion you get to have. Now that was a lot about tech. So lets look at the fundamental usage. Hows and whys. The biggest why is the potential fullness it adds to the experience. That Hillsong track you are playing this weekend was recorded with potentially far more musicians than you have on your stage. Having some added parts can really enhance the feel of the song. And also because it has a metronome and song cues, your team can really sync up well together and know where they are in the song. Using something like pre-made keyboard pads, also can help cover transitions and make key changes. They are great space fillers that can setup moments. And for sheer simplicity, pads can easily be played from a remote location rather than your keyboard player having to walk out on stage to the keyboard. Thus potentially causing distraction while your pastor is wrapping up. The added music helps draw things to a close, but someone walking on stage can take people out of the moment. So pads from the FOH can really help save the moment. But there are 3 big things to watch for when using tracks and clicks. Lack of Space: These songs are set to a click. Repeating a chorus, adding more time in an instrumental moment, or taking more time to talk over the intro before the verse starts are out. The track will move on without you. You have to plan other spaces to engage that you might have previously done within the song before. Or you have to plan in advance that you are going to double the intro of the song to talk over. So now the track is modified to meet this need prior to service. But, we know Jesus is not confined by our shortcomings or that of our technology. The structure does not mean the Holy Spirit doesn’t move. You learn to get the right flex and leadership through these moments. Unprepared Team: This is a biggie. These tracks often come with every instrument in them. From lead guitar lines to backing vocals and full drum parts. If you are not careful in their usage, this can easily lead to your team getting lazy. “It’s in the track so I didn’t learn that part.” could become a very regular sentence if you are not careful. Use only what is needed in your tracks to fill in the sound. NOT A BAND REPLACEMENT: People are preferable to a track. There are times when a huge karaoke set might be fine, but under general rule, you’ll have a better engagement of your church with people on stage. If you don’t have a drummer for the weekend, probably smarter to go to an acoustic set rather than use the drums in the tracks. But there might be times when even that might be what is needed and it is better to use the drums for that song. Tracks can be very helpful and compliment your worship set. Find the right usage for you and try them out.